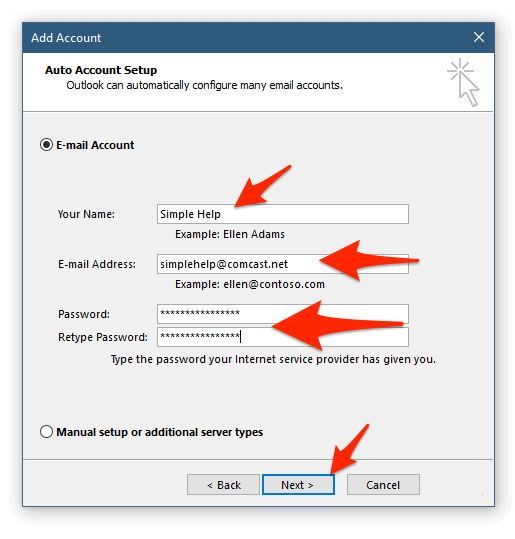 This guide will take you each step of the way through setting up Microsoft Outlook (2016) to work with your @comcast.net email address. There are only two things you’ll need to know ahead of time in order to set up your Comcast email in Outlook 2016 – your comcast.net email address and the password associated with that account. If you know those two things, you’re ready go to! Launch Outlook. When it starts, the ‘welcome screen’ should appear. Click the Next button to begin the setup. Note: if the Welcome message doesn’t appear, jump down to the Create New Account section below. 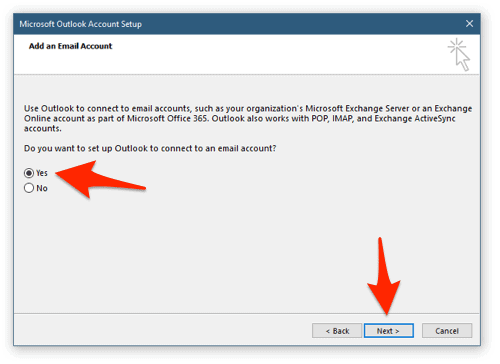 When you’re asked if you want to set up Outlook to connect to an email account, make sure that Yes is selected and then click the Next button. This is the ‘main’ setup window. In the spaces provided, enter your name as you’d like it to appear in your emails, your full @comcast.net email address, and your password (which you’ll need to enter twice). Then click the Next button to continue. The last ‘check’ that Outlook performs before it finishes the setup is to send a test email – to yourself. This is all automated and happens ‘behind the scene’. Finally, once all of the settings have been confirmed, click the Finish button. Outlook 2016 will now open and begin downloading all of your Comcast.net email messages – including the ‘test’ message that Outlook sent a few moments ago during the setup. No big deal, you have to start the ‘setup wizard’ manually. Click File from the main Outlook menu. Directly below the Account Information section, locate the Add Account button and give it a click. Now just scroll back up to Step #4 in this guide and carry on from there.